PHOTOS - Bareilly Ki Barfi actors show off cool dance moves on Dance Plus 3! PHOTOS – Bareilly Ki Barfi actors show off cool dance moves on Dance Plus 3! Ayushmann Khurrana, Kriti Sanon and Rajkummar Rao showed off some groovy dance steps on Dance Plus 3, as they promoted Bareilly Ki Barfi on August 3, 2017. The actors interacted with Remo D’Souza and the mentors Shakti Mohan, Dharmesh and Punit Pathak on the sets and showed off some of their dancing skills too. 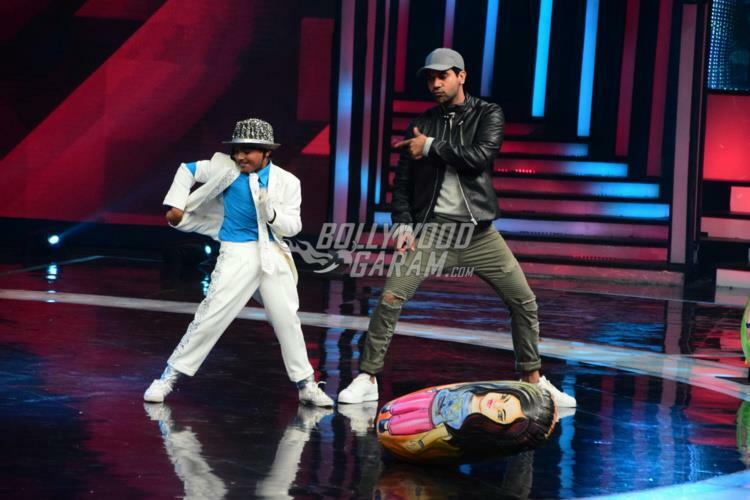 Rajkummar was seen taking some lessons in dance from a little contestant on the show, who is known for his unique Govinda style. Kriti looked pretty in a pink crop top and a long skirt while Ayushmann was seen in a black and white shirt kurta and black pants. Going by the pictures, it seems like the lead actors of Bareilly Ki Barfi had a great time dancing and watching the talented artists on the show, who are mentored by Shakti, Dharmesh and Punit. The upcoming film is scheduled to be released on August 18, 2017. Previous articleAkshay Kumar reveals PadMan release date & poster - to hit theaters in 2018!